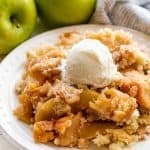 This Old Fashioned Apple Cobbler has a warm, spiced apple filling and is topped off with the perfect sweet biscuit crust. People absolutely love this from scratch recipe and you will too! Preheat oven to 350 degrees. Spray a 9×13 pan with nonstick cooking spray. In a medium-size mixing bowl, toss apple slices with brown sugar, cornstarch, cinnamon, nutmeg, and vanilla. Spread them out in an even layer in the 9×13 pan. Scoop the batter in large clumps on top of the apples to form a rustic cobbler crust.